One man’s tryst with conservation and preservation of culture flourishes in manipal. A open air heritage village museum. There are clinical tourist spots and then there are those that exude the essence of its culture and inhabitants. In a human’s desire for progress towards a better life, often times, innovation dictates trends and that in turn has far reaching effects on heritage and culture. This angered a banker from Manipal — the university town of knowledge and education. Vijayanath Shenoy (1934 - 2017) was a renowned heritage conservationist and antique collector who witnessed majestic homes and structures that housed generations of history being torn down, razed to the ground with no regard for heritage, art or aesthetic values. He had at times saved artifacts from garbage dumps and kitchen fires, and helped preserve them. His own house was his first ethnographic museum which he later turned into a trust with like-minded people. Today, it is called Hasta Shilpa, an open air museum. His journey was not easy, and his family supported this dream where he dipped into his meagre savings. The only help he was able to garner from the government was about 7 acres leased land where Hasta Shilpa stands today. Their first aid came from the Tata Trust. Over a period of time, Scandinavian, Norwegian and Finland associations have also aided this project that aims to conserve and preserve Manipal’s history. Collecting artifacts and antiquated objects from heaps of discarded scrap materials and demolished structures, he not only paid for them, but took on the laborious process of numbering, cataloguing and transporting them in the early 1970s. 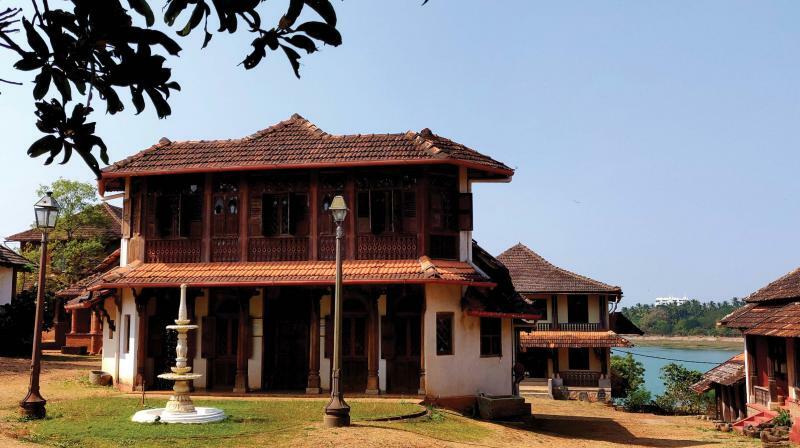 After 10 years of dogged effort, Hasta Shilpa, a heritage village museum was started. Museums where artifacts were locked up and displayed in glass boxes was not his idea of restoring antiquity. The idea was to make people walk through the experience of a bygone era. Thus apt music wafts through the experience as appropriate fragrances enhance this journey into a bygone era. Hasta Shilpa has reassembled homes and structures from as far back as the Vijayanagar Empire. The museum has peeks into the Deccan Sultanate, Mangalore Christians and Coastal Brahmins dwellings, dating back to the heritage era! A wonderful experience, the aesthetic display of culture and art is vivid, interesting and an ode to this area’s past history. A must-visit, if you are in the university town of Manipal, it is a 90-minute drive from Mangalore and Udupi. Hasta Shilpa organises 90 minute guided tours that explore every structure, reliving each era — be it a building, artefact, doll or utensil. Be prepared for a good walk as it is an expansive space. One can take any two guided tours — The Southern Stroll on Wednesday, Friday and Sunday or The Eastern Jaunt on Tuesday, Thursday and Saturday. These walks cost Rs 300 per person, and start bang on time, so be on time. Another great experience is the Heritage by Night walk on Saturdays and Sundays which costs Rs 500. The history that one is privy to is rich, and with all the structures elegantly lit up, it’s a wonderful experience. Manipal is a university town in Karnataka, close to the temple town of Udupi. Manipal University is a deemed University started by TMA Pai 64 years ago, so the vibe of the area is both youthful and olden day. Safe for single travel, a trip to Mangalore for a day is a good idea. There are many temples, churches and Tipu Sultan’s edifices alongside beaches and rivers to see too. With many seafood restaurants which are inexpensive, try Narayana, a famed local hub in the market. Shankar Mahadevan, the singer vouches on its food. You must have the coastal cuisine of Mangalore — fish curry rice, fried fish, crabs, squid etc. Even the vegetarian food here is simple, and delicious. Except for Hasta Shilpa, there’s not much else to see. There are two other tourist sites of interest in this small educational town. One is MAP — Museum of Anatomy and Pathology, which will be of interest to medical and biology students, and it takes three hours to visit. The other scenic place is End Point, a jogger’s park with a view of the sunset, and river. Interestingly, the park is only open around sunrise and sunset, and remains locked up through the day. If you are at Manipal, do travel around to walk on the Malpe Beach. Mangalore is another tourist destination about an hour away. Local transportation is well connected, and the roads are good but traffic laden.